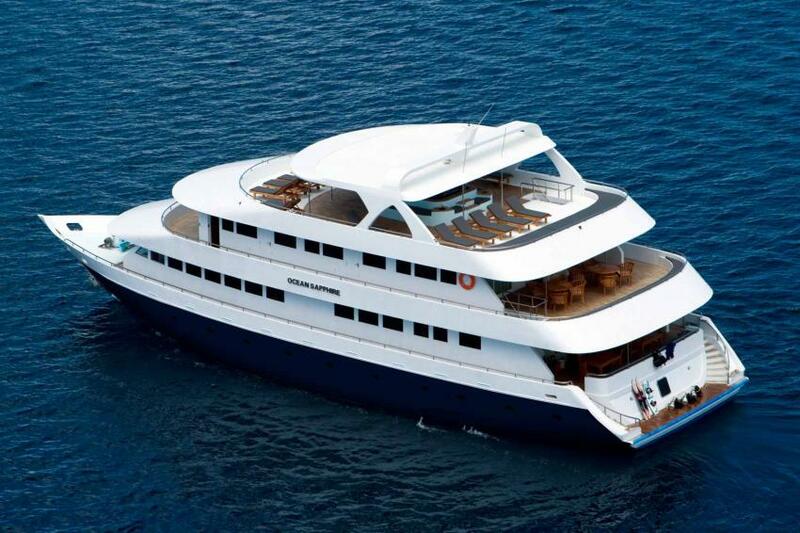 Ocean Sapphire modern luxury liveaboard customized to make your diving vacation on Maldives comfortable and fun. Ocean Sapphire has 11 cabins that can accommodate 22 divers. 7 staterooms are located on the lower deck. All are en-suite and had individually controlled air conditioning. There are also wardrobes and safes in each cabin. Upper deck rooms have big windows in addition and you can enjoy the gorgeous view of Maldivian blue waters. This cabins also equipped with TVs. Lounge and dining areas are located on the main deck of Ocean Sapphire. Here boat’s passengers can relax, watch TV or DVD. Boat has a perfectly equipped sun deck with sun loungers and jacuzzi. What can be better than to relax in a hot tub and enjoy breathtaking views of Maldivian Atolls? Dive deck of Ocean Sapphire has all necessary amenities to make preparation for dining comfortable. Diving dhoni is equipped with Bauer compressor. There is also a possibility to use nitrox on board if you have EANx certification. Safety is always important for the Ocean Sapphire team. Boat equipped with first aid kit, life vests, and emergency rafts. Ocean Sapphire itineraries include all the best that Maldives has: central atolls, south and deep south atolls. Ari Atolls are famous for a variety of corals. Hammerheads and mantas are common for this area. One of the main attraction of diving in Maldives a chance of meeting whale sharks. These gorgeous animals can be spotted while diving near Vaavu Atoll. Also divers can see manta rays, threshers, and many more others during diving on central atolls. South and deep south atolls are known for unspoiled coral reefs. There is no such crowd here as on central atolls. Current are mostly strong that causes a big amount of fish.